I currently have 2 great nieces and now have a new great nephew. He's an early bird but doing well. He came about 2.5 - 3 months early but he is doing well and is holding his own. Since he is in another area of the state, a cake made of diapers was out of the question. 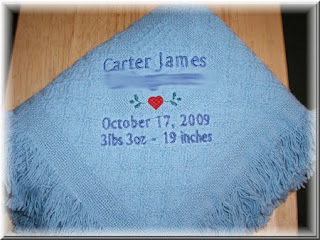 So, I turned to the next best thing and embroidered a baby blanket for him. I always debate whether to add the height and weight to the blankets. This time I did since he was such a small weight baby. Here's his blanky. I smudged the last name in the photo. 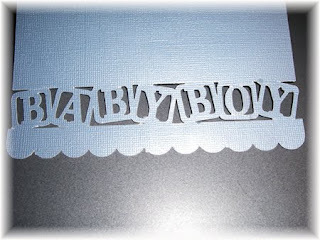 I also had the die cut machine (Silhouette) cut out a quick baby boy card. This turned out better than I had expected. Only a few areas of the cut out were difficult to remove. The baby blanket looks awesome! If you don't mind me asking...what do you use for stabilizers on that type weave? I have a request from a friend to do one and I have never tried machine embroidering on one of those type blankets/throws...Thanks in advance for any suggestions you might have. Hi Deb, thanks for the question. I used Sulky sticky tear away stabilizer. Isn't the easiest to get off the back but I use tweezers. I have also used the Super Solvy stabilizer. I would have emailed my reply but your profile has no reply.